The idea of simplifying your website design is indeed one of the essential ways to enhance quality and ease of use of a website. With the possibility that users of your website get confused due to its complexity, you are also making them not to trust your business. In case you are stuck in this kind of problem, you should try these tips to streamline your website design for better user experience. If you are not going to hire an expert designer, which also means that you will be the one who is going to design the website, to follow the basic rules for the website design creation is very important. Take note that these rules in making a website design are important. You will learn simple steps to ensure that your website will come out perfect. 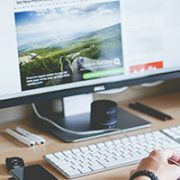 In website design, the 80 and 20 percent rule has a very large effect on the decision you make for designing your website. This is one of the rules that make the whole design work with the interest of every visitor to your website. Value and content are supposed to be taking the 80 percent of the website while the remaining 20 percent will take for the other elements of your website. In doing the overall content of your website, make sure that the larger percent of the website’s design will effectively work. There are some unnecessary additions to your website that makes it really complicated and difficult to learn. Because of this, the chance to make a perfectly simple but very useful type of website is being achieved. You can have this part or tip as a solution for the fact that not all pages are truly needed. Just have the basic information that you have to sort off and make it compiled in a clear and easier way. Make the buttons within the pages of the website you are building user-friendly. Take note that the lesser the pages, the clearer view of the website will be given. The simple look of your website will also be based on how you have settled the overall view of the website. In case you set website pages that have been surrounded by too many advertisements, expect that you will not really catch the attention of your visitors. Aside from that you also take away all your visitors to the real purpose of your website. They may have the confusion not only on the part of scrolling and clicking on the pages of your website but also on making their own perception of how reliable your online business is. Focus on the content as it is also a beneficial factor in making sure that your website design will come out great. Take note that in every piece of content that you create, there should always be the focus on the proper content creation. Of course, these website contents will have a huge role in making the right impression on people to your company. When you take this content in the designing process, be sure about where it’s placed on the website and how they could make an effective solution for your website to become simplified yet effective. Highlighting is a form of emphasizing the content or specifically the information that you want the visitors to discover. This way makes the proper solution for your website to get more professional looking. The highlighted information leads your customer to the information which they may really be enticed or purposely searching from your website. Indeed, it is another great way to enhance the possibility that your website will be the most visited or highly generating traffic. In designing your website, too much color has its huge effect on the efficiency of your website design. Use Adobe color wheel to find the perfect color matches. You can take a look at the website that has fewer colors and you may have that realization that it is better than those with overloading colors. Stick with a simple color palette. Once your website visitor has landed on your website page and they have seen your professional colors, their attention will be diverted to more important things on your website. The website you have designed will be useless if you don’t use the right colors. This will stop your visitors from the real intention of your website. There are uncertain elements that should not be on the website pages of your business. Because of these elements, your website is unknowingly destroying the impression of your website visitor. When you include special features too, make sure that they (your visitors) will be able to experience how it works and how it really gives them the lead to their real purpose on dropping by your website. If possible, focus only on the features of the website design that you want to include on your website. You always have the potential to make a better streamline for your website design. These tips mentioned above is the sort of ideas that you can take or apply on your plan to present your potential and current customers with a better website design. These are the tips that you can use for a guided solution. Moreover, these tips have been proven effective enough in bringing an essential solution for all website designers to have a great website in every search engine. If you need help in a redesign or new website design contact us today.